Stop making assumptions! As an SEO, I have to remind myself of this–question data, question the client, question past and current link development. One assumption I see many companies and website owners make is that Google Analytics gives them everything they need to properly analyze their site. This simply isn’t true. For many, Google Analytics is constant background noise in their browser. Unfortunately, not all of us are Google Analytics pros, number crunchers, or programmers–sometimes we avoid the more complex applications of Google Analytics code. I know there are times when I’ve been afraid of breaking something on a site so I’ll hesitate to implement the code I hoped to. Without mistakes we can’t grow and this is why there are “undo” features, local backups, lots of online tutorials, and professionals you can consult with like analytics evangelist, Avinash Kaushik. Through reading and experimentation I’ve found that there are a lot of elements on any given site that can provide major insight into customer retention, conversions, and goal funneling if properly tracked. But, these elements aren’t out-of-the-box ready for Google Analytics, they require the addition of event tracking. A lot of sites tend to avoid event tracking implementation, because of an assumed lack of knowledge or skill. Well, I’m here to tell you that as scary as Google Analytics code can look, more often than not, putting this little snippet of code on the site is a fairly painless process. 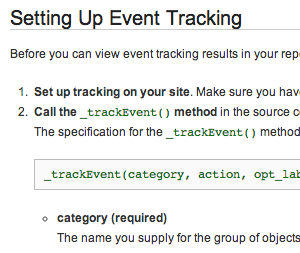 Let’s talk about three potential event tracking actions you can start using today. Since this tracks people who click the download link (and don’t necessarily save the file), it still won’t be 100% accurate for unique downloads. I know I have downloaded the same document numerous times because I kept forgetting to save it! Just keep that in mind when using event tracking, and analytics in general. Nothing is completely accurate; it’s all relative. Video can really increase click-through rates from search results and benefit user interaction and time on site, which can affect customer retention (positively). Once you’ve created that great video, what do you know about it? Perhaps not much, especially if you aren’t using YouTube embeds. Google Analytics will tell you how many people viewed the page the video is on and average time on site, but you can’t assume that everyone who came to the page viewed the video. You know what happens with assumptions! If video is a large part of your on-site content strategy, you’ll want to work to include more granular tracking of video views, plays, pauses, and exits. Relying on data from YouTube Analytics (if you’re using YouTube embeds) won’t necessarily be accurate for the number of views on your site. For example, if you have the same video in multiple locations, or want to see how many people exactly (rather than a percent graph as in YouTube Analytics) left your video without finishing it, you’d need to use event tracking. Through even tracking you also don’t have to switch between YouTube Analytics and Google Analytics–and not everyone uses YouTube. Some of this data could be pulled in through Google Analytics in other ways–blog article click-through rates from the homepage could probably be determined through the Navigational Summary report in the Content section of Google Analytics, but event tracking allows more pointed targeting. Since you installed this specific code where you wanted it, generally you can be more confident about the accuracy of the data you’re gathering.